The best thing about weekends is the family time. Somehow we managed to scrape a few bucks together, and so we started off the weekend by making Friday a "McDonalds Day". When it's hot and you're tired, who feels like cooking? Of course, seminary living allowances (R1350 per month) do not allow this indulgence too often, which makes it all the more appreciated when we can spoil ourselves! Then in the evening James went to his first meeting at his new Scout troop, 4th Pietermaritzburg. Some of the other Scouts are in his class at school, so he soon felt right at home. While James was at Scouts, Belinda and I managed to steal a couple of hours to go out on a "date", and I can't remember when last my favourite girl and I shared a waffle together! This morning it was up bright and early for James' rugby trials at school. I'll give my kid credit - he has a go at everything! He made it onto the "yellow" team - I'm not quite sure where that is in the pecking order, but considering that he's never played rugby in his life before, we're proud that he made a team at all! We also had a bit of a chuckle as these 11 and 12 year olds engaged the scrum, grunting as they made contact (just like the "big boys" do on TV). And who knows? Maybe we'll see some Sharks coming out of this young squad in about 7 or 8 years time? 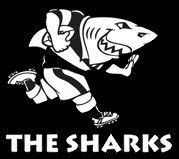 I know my father (an ardent and die-hard Sharks supporter) would be most proud! Tomorrow is Sunday, which means church at Prestbury followed by a service at one of the local old age homes. I always used to get a lot of leg-pulling in Uitenhage about my harem of octogenarians, so this may end up being an area of active ministry here as well. It's also the Scouts' annual "BP Parade" and service in commemoration of the birthday of the late Robert Baden-Powell, who was the founder of the Scouting movement. Some vehicular juggling is clearly going to be needed! But if I'm making this whole family "thing" sound like work, nothing could be further than the truth! When I think of all the long hours I used to spend cooped up in an office, being able to cart my family around to various events is indeed a joy and a privilege. God has truly blessed me!